Serious praise for a "highly developed communist state" like China, even if the reference to the "communist state" was a little embarrassing for some of those present, for whom it was a little unclear what the Chinese "comrades" meant when they declared themselves committed to completing the "construction" of their socialism by 2050. It is also true that another "Marxist" who is dear to their affections (the late Losurdo ) had criticised as too "abstract and utopian" Marx’s vision of the fundamental extinction of the state in a communist society. So, amongst the various expert snake charmers (many with salaries directly paid by the bourgeoisie), there was also a Domenico Moro who claims that the state must become "an expression of the interests of the community"; not only that, but that the management of state intervention "includes the participation and control of workers ..." (Globalisation and industrial Decline). So, they have had enough of "wild free-exchange" and acclaimed their unconditional(?) support for the Chinese policy of peaceful cooperation (viz in Africa ...) accompanied with eulogies about the "creation of wealth and (capitalist - ed) development _as a way to halt immigration"_.
 Rifondazione Comunista (Communist Refoundation Party) was originally the “tankie” split from the Italian Communist Party when it declared itself the Democratic Party of the Left in 1991 (after the collapse of the USSR). At that time it had 35 seats in the Chamber of Deputies but today it has none, having gone through a series of splits and political transformations which saw it even supporting Italian participation in the invasion of Afghanistan. It now tries to unite leftist activists around a variety of issues for electoral purposes. Domenico Losurdo (1941-2015), Self-styled Marxist academic philosopher; member of the Italian Communist Party (PCI), then Rifondazione. Despite a reputation as an iconoclastic thinker, he never really broke with Stalinism and was sympathetic to Maoism. We are talking about $1,400 billion of infrastructure investments for maritime, road, airport and railway works. In 2001 Chinese trade with the Mena area (Middle East - North Africa) amounted to $20 billion and rose to $245 billion in 2016. In two years China has already invested over €3.1 billion ($3.7 billion). And, as far as Italy is concerned, the airports of Genoa, Savona and Trieste are particularly interested in the project, as points of arrival for traffic from China to the Mediterranean, through Suez. The "Spartacus" group which defines itself as Trotskyist (Fourth Internationalist) says that Cosco, is not a "capitalist company" but "a component of the Chinese collectivised economy". And in China, where there is "a workers’ state deformed by the CCP bureaucracy" it is only for this reason that Cosco implements "starvation wages and flexible contracts that bleed the workers"! (Literally, you can read it in their newspaper ...). The collective motto of "hard work = happy life": includes "12-hour shifts for a handful of euros". However, –according to Spartacus – this "socialism with Chinese characteristics" (as defined by the rulers of Beijing), does not make China "an integral part of the international imperialist system". These Trotskyists explain (?) 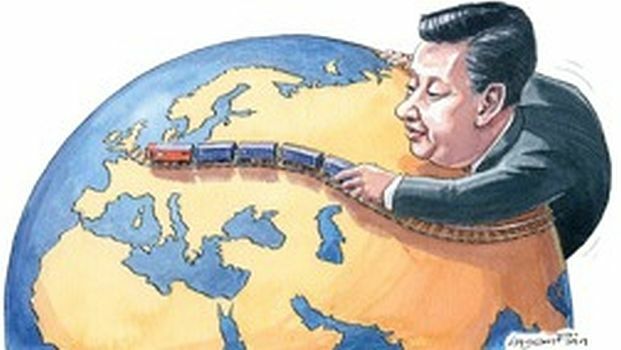 that "participating in world trade is neither capitalism nor imperialism". And in fact – they continue to tell us – even if "a capitalist class has developed" in China (? ), it does not have "political power", and if it gained power this would "destroy the workers' state and those forms of collectivised property at the base of break-neck industrial development (disruptive growth rate) and of the enormous achievements for the workers and peasant masses". In addition, there would still be "control of the financial sector by the State Banks" ... And if anyone has any "doubts", they should understand that "investments (of capital - ed) of China abroad are not driven by the search for profit". A few lines later, however, the writer admits that the production (of goods) in China "is organised to produce profits to meet the needs of the life of the masses" ... We repeat: it’s all there in black and white, in Spartacus, October 2018.